I saw this video yesterday and think that it's a really well made video that may finally get some people to wear their seatbelts while driving here, which is a step in the right direction towards a better attitude to driving and road safety in general. Or you can click on this link to watch it on You Tube (it's only a few minutes, it's in Arabic but there are English subtitles). Between January and September 2012, there have been 5,759 reported road accidents, which has killed 814 people and injured another 8,278 people. An average of 640 accidents, 90 deaths and 920 people injured every month this year. In 2010 (entire year), there were 7,556 accidents, with 1,051 people killed and 10,046 people injured. 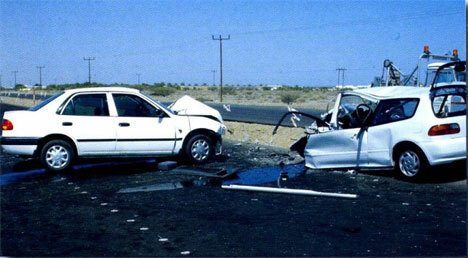 An average of 630 accidents, 88 deaths and 837 people injured every month for 2010. So, to sum up: More people are dying and getting injured in accidents this year than in the last 2 years, and to put it another way, someone has died on the roads of Oman, on average, every 8 hours of every day this year so far. If I meet one more person who brags about the number of speeding tickets they have (I recently met someone who proudly claimed he had over RO 4,000 in speeding fines) I will consider slashing their tires to keep them off the road. I've blogged about this before and we've said it many times before: ROP need to do a better job at enforcing the rules of the road. Who here has seen an ROP officer talking on their mobile phones while driving a police car? Or how about speeding without their lights / sirens on? Or how about pulling people over on the side of the highway without their lights on to warn oncoming traffic? Or how about having driven past a police car, breaking the speed limit in the process, and not been pulled over by the cops? It's really simple boys and girls: Speed kills. So does being a lazy idiot and irresponsible vehicle owner, but lets start with one issue first hey? Hello to the Yaris driver going the wrong way up 18th Nov St yesterday at 8.30am. Yaris drivers: your car is not a dodge-em! I once heard a highway patrolman say "I have never had to unbuckle a dead body." Wear seatbelt so you will be alive to come home to your family. Some of the worse driving I have seen here is by the Driving Instructors. What hope does a country have if they are being taught badly in the first place. I actually saw a learner driver run a red light at the Qurm junction the other day, that is almost like suicide. People must realise that for every action there is a reaction, a 10 OMR fine for an offence is a waste of time, but a fine and licence taken away might be a good deterrent! Maybe start with a published and clearly-defined highway code? After that, the nub of the issue is as you've said: train the police and driving instructors. I don't blame people here for not being able to drive. How do you learn if nobody is qualified to teach you? Agreed on the seatbelt thing anyway; it's progress. It might not stop people driving into each other but will affect the mortality rate drastically. I'd be interested (an no doubt sad) to know the percentage of fatalities who are children. Even adults who wear their seatbelts don't seem to apply that to their children. That's something I'd like to see enforced as the number one priority. Life is cheap these days in Oman. yet another tragic accident - al zahara college bus crash that killed 3 students and injured 31 students. "loss of control". on the day that the safe driving expo started nonetheless. this was not covered by the times of oman or the muscat daily. How about sending a signed petition to the Ministry asking for stringent laws or at least a pilot-run on fines against dangerous driving. In my limited driving experience (since June 2012)in Oman, I am usually petrified of folks who do not seem to understand that roads are not F1 tracks.